Gajeel and Juvia react in shock at the sight of Touka's tail, but it disappears without a trace and Touka is confused at their reaction. To my genuine surprise and gratitude, this does not result in an attempted up-skirting. And another surprise comes right after when we return to the mage Guild Sabretooth! I love these guys! Levy, at this point, you're the weird one here. It turns out that Angel/Sorano joined Sabretooth after the events of the original series, wanting to baby her sister Yukino as much as disgustingly possible. And who is visiting this Guild today? It's him..... The one I've bitched about soooooo many times in the past.... Jellal, leader of Crime Sorciere! Jellal tells Sting and Rogue that he is searching for someone who is pretending to be called "Touka", and must be avoided at all costs. I like her, but I'm still not used to Good Minerva. Finally, we return to Elmina where our heroes are hiding out. 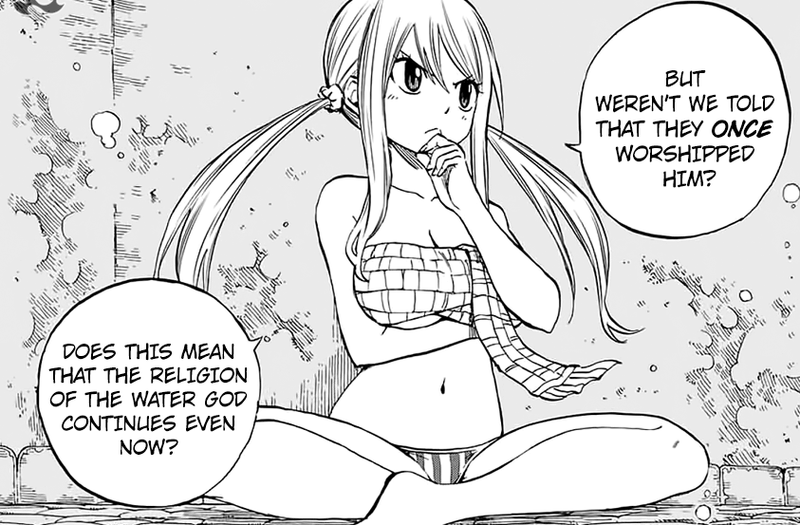 Lucy is using Natsu's scarf as a bikini, until she uses Aquarius' star dress (which I don't understand. How is she able to summon the power of a Celestial Spirit she can't use right now?) and wonders why they are so loyal to the "Water God" dragon, but Gray is more concerned with how Kashima told the readers that more humans had visited recently. I genuinely hope that people are making fanart of this current design. As they talk, Lucy realises that they might not need to defeat the Water God, since the task was to "seal them". 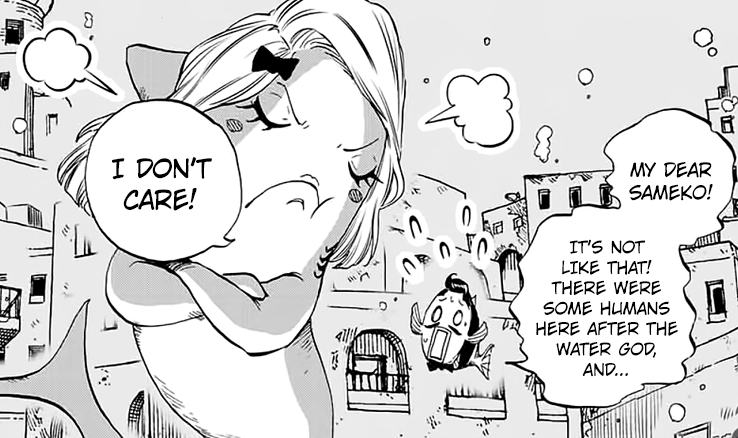 This makes Lucy wonder if they could calm the Water God's anger and resolve this entire affair peacefully. Natsu reluctantly agrees, but does his usual vow that he'll fight if they hurt his friends. To continue their situation, Lucy gets an idea. We see Kashima trying to beg for forgiveness from his girlfriend Sakemo over how he trusts humans, and the gang have used the power of Gemini to turn themselves into fish. We get another jellyfish moment in this manga, and Gray runs swims into Kashima by accident. 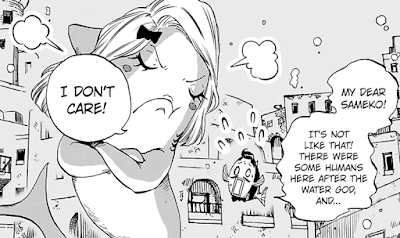 Gray asks what happened to the last humans that arrived in the city, and we see Natsu currently finding them through scent, in their call. A woman with a crest on her shoulder, set to be executed for the Water God. Opinion: I think these fish are scared. From what we've seen and heard, it's clear that the fish are not bad seafolk. They just want to praise their God and do what they think is best for him, be it protecting or offering tribute. If I had to guess, which I do, I would say that they are executing this woman in the hopes that the Water God will be happy again and stop doing... something... to them. Think of it like throwing the virgin into the volcano because their crops have gone bad. It's new to them. I doubt these guys have a history of murder behind them. *sigh* I miss the smexy Pisces' duo that Yukino owns. The Water God Dragon itself is still a no-show, sadly, so I am hoping this build-up is worth it. They've gone far to imply that the Water God Dragon is needing protected for some reason, so perhaps they're in a deep sleep? And if woken, their morning coffee could destroy them all? Maybe the city wasn't underwater before, and lots of people drowned? We'll find out soon enough. It's interesting to note how many side characters are starting to get involved in this Touka subplot. 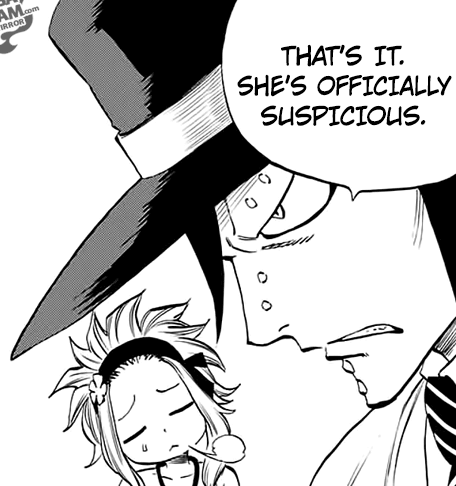 This has gone from Gajeel, Juvia, Levy and Pantherlily to Sabretooth and even Crime Sorciere seeking her out. Is she a vessel/prophet of the Water God Dragon? Is she actually the Water God Dragon in human form, with an Exceed following her? Can we all take a moment to appreciate how perfectly happy Sorano now is, and how far she has come? I find it adorable. Lucy's mentioning of Elefceria's wording, "Seal the dragons", has me even more convinced that he is evil. Sealing the power of five Gods? As in, leave them vulnerable for the taking so Elefceria can become stronger, regain his youth, kill Master Roshi and Chiaotzu, and then take over the world and wipe out humanity! As for what I mentioned at the beginning of this review, "I figured it made sense to see how this is doing as a sequel to the original series so far", I find it rather underwhelming. I'm not saying the series so far is bad, but it is certainly beginning to feel like more of the same but less of it. The stakes aren't particularly high and nothing feels different. However, we're only five chapters in. Plenty of things can change over time, depending on how long this series is. 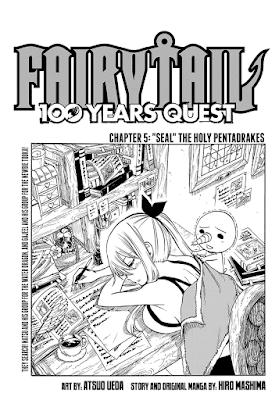 Maybe Dragon Ball Super raised the bar too high for me, but I really want to see some next level Fairy Tail shenanigans and action. 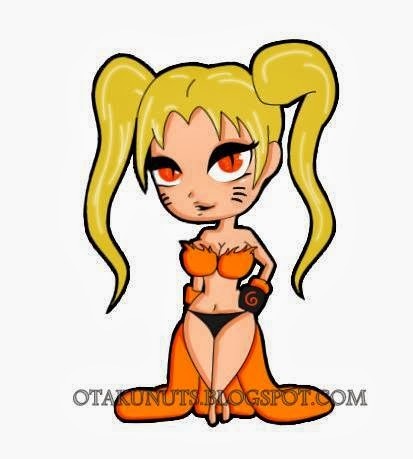 Natsu, create lava! 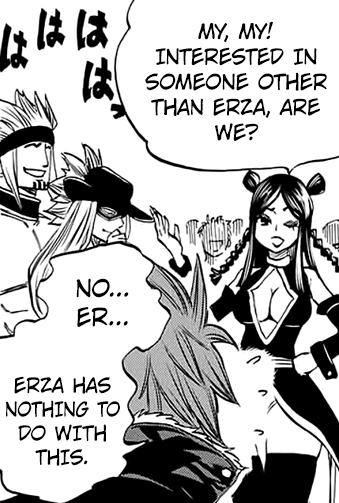 Erza, put swords on your swords! Carla and Happy, be better! Character of the Week: Lucy for deducing Elefceria's words and opening up what I believe to be Elefceria's plot. Worst Part: Still no Water God Dragon. Ah, her breasts are visible. Then this must be the protective battle armour that so many fantasy women wear!